FILE - In this Jan. 19, 2018, file photo, San Francisco Giants President and CEO Larry Baer is shown during a press conference in San Francisco. Baer recently took a leave of absence from the team after the release of a video that appeared to show him in a physical altercation with his wife. 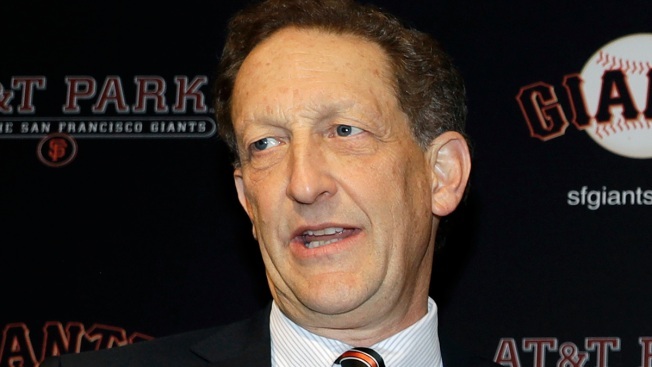 Major League Baseball has decided to punish San Francisco Giants President and CEO Larry Baer following a public altercation with his wife in which the couple tangled over a cellphone and Baer's wife fell to the ground. The league on Tuesday announced Baer has been suspended without pay through July 1 in connection with the March 1 incident. Baer will not be allowed to have any involvement with the operations of the team during his suspension, according to the league. "Based on my review of the results of the investigation, I have concluded that Mr. Baer's conduct was unacceptable under MLB policies and warrants discipline," MLB Commissioner Rob Manfred said in a statement. "In determining the appropriate level of discipline, I find that Mr. Baer should be held to a higher standard because as a leader he is expected to be a role model for others in his organization and community. Based on my conversation with Mr. Baer, it is clear that he regrets what transpired and takes responsibility for his conduct." The incident garnered national attention after a video posted on TMZ Sports showed the couple in a heated argument during which Baer appears to pull his cellphone from his wife, Pam, as she clings to the device and is seen tipping over in her chair and falling to the pavement. In the video, Baer's wife, Pam, can be heard screaming: "Oh my God, no, help!" The San Francisco District Attorney's Office did not charge Baer, saying the evidence did not support criminal charges. Baer publicly apologized for the incident and took leave from the Giants. It's possible his role with the organization as a representative at community events and celebrations could be scaled back moving forward. And he will no longer be the reprentative for the Giants with Major League Baseball. "I respect and accept the Commissioner's decision, and appreciate the fair and thorough process undertaken by MLB and the Giants. I made a serious mistake that I sincerely regret and I am truly sorry for my actions. My unacceptable behavior fell well short of what must be demanded of every person, particularly someone in my position and role in the community. I will now immediately begin the significant work ahead of me to listen and learn from my mistakes and to seek professional advice. I am committed to doing what it takes to earn the trust and respect of the many people impacted by my actions." Rob Dean, the son-in-law of late Giants principal owners Harmon and Sue Burns, will take over day-to-day operations of the ballclub on an interim basis, but it's believed he'll continue in that role once Baer returns in July.